Cookbooks make good traveling companions, don’t you think? With a pencil in hand, hours of entertainment are yours for the simple asking price of three to five pounds of extra weight in your carry-on or backpack. I used to travel with other peoples’ books until I started traveling with a full suitcase of my own. The best part about returning home from a book tour is returning home to Oakland to catch up with friends, and scrounge around in the cupboard and cobble together dinner with Nathan. Part of playing catch-up involves making tea dates or penciling in time to walk with friends. But recently, I played catch-up in a completely different way: taking two cookbooks written by Bay area friends on a road trip to Santa Ana. While Nathan drove and listened to AM sports talk radio, I dove into one book and then the next, pencil in hand. Each book showed the imagination of the person penning it. Now being on this side of the cookbook process, my respect has amplified at least a thousand fold for anyone who sets out to write a cookbook. For those of you prone to the idea of book babies and birthing a book, imagine a year or more of labor without an epidural. It’s quite a feat. I will never forget meeting up for lunch shortly after I’d begun working on Steeped full-time with my friend, Shauna Sever. She shared her experiences with levity, for which I will always be grateful. 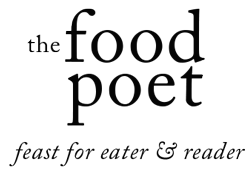 When a cookbook is written well, you can hear the voice of the writer leap off the page. Shauna knows the craft of telling a good story and has a distinct personality on the screen of her blog and also on the pages of her books. Her last cookbook, Pure Vanilla taught me all about different kinds of vanilla–don’t get me started on her recipe for Malted White Hot Chocolate. My relationship with all things malted borders on obsessive. 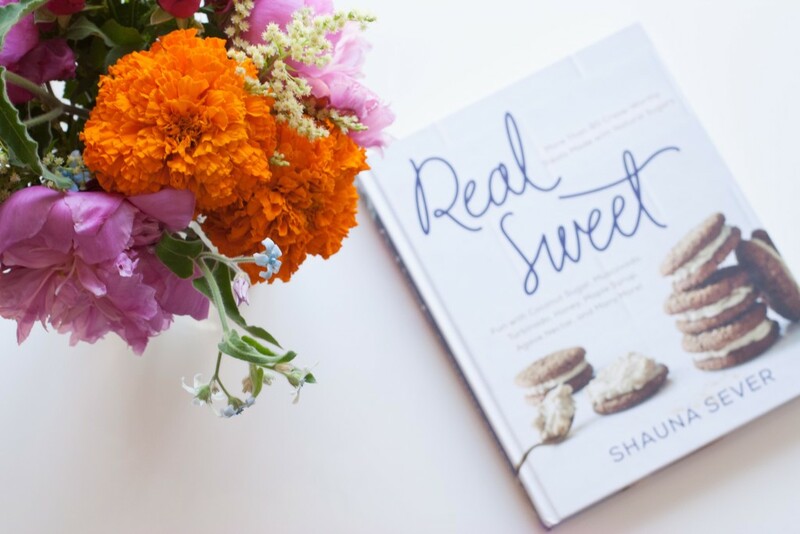 Shauna’s new book, Real Sweet takes on the topic of baking with natural sweeteners. With her snappy sense of humor, she shows her extensive knowledge in a way that is approachable and leaves the reader feeling smarter. By the end of the book, I definitely felt smarter, ready to break out the coconut sugar or demerara. 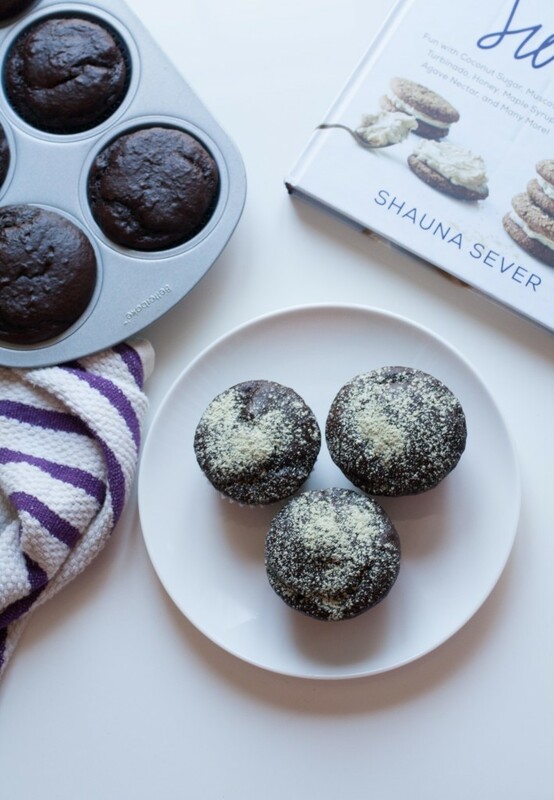 Shauna’s described as the next door baker and it’s really true. She is just the person you would want to have living next door, sharing sugar (turbinado!) and plates of oatmeal cookies (Mrs. Braun’s!). I figured who better to demystify the flavor possibilities of natural sweeteners than Mrs. Next Door Baker herself. The book is arranged into seven sections that take on different kinds of baking situations and focus on a particular natural sweetener. All-day snacks and lunch box treats star the femme fatale, coconut sugar, while the picnics and potlucks section explores turbinado, the hero. My cupboard happens to possess almost all of the sweeteners mentioned in the book, so naturally, I began dog earing pages for later consumption–ahem, research. Rhubarb and Rose ice cream with agave nectar? Say no more. Chocolate Chip and Cherry Date Cake sounds great. Oatmeal and Turbinado Cream Cookie Sandwiches might make it on the menu before the month is out. 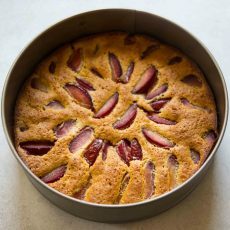 I’m open to opportunities to whisk, spoon and be the Friday afternoon heroine, showing up at a certain Oakland office building with baked goodies. Could it be yours? Maybe. On this occasion I had visions of cupcakes dancing in my head to celebrate the victory of our hometown Oakland Golden State Warriors win during game 3 of the NBA play-offs. And, I wanted to pillage my pantry rather than go to the grocery store. I flipped open Real Sweet and landed on the Maple Chocolate Cake. Cocoa powder? Check. Greek yogurt? Check. Maple syrup? Check. Yes. As I finished scanning the ingredient list, my cupcake delivery plan started coming together. What I like about this cake is it’s not too sweet but it has great bounce. I poked a few dark chocolate chips into one of the cupcakes and wouldn’t you know, it tasted amazing. But here’s the thing with friendship: you bring who you are to the table and they bring who they are. So, I hope you won’t be disappointed to learn I had to find a way to sneak tea into these black beauties. And, let me just tell you. Dusting the maple chocolate cupcakes with matcha powdered sugar might have been my second best decision of the day. Because good decision number one is sharing with you a book from a person who is as real and sweet as her book title suggests. 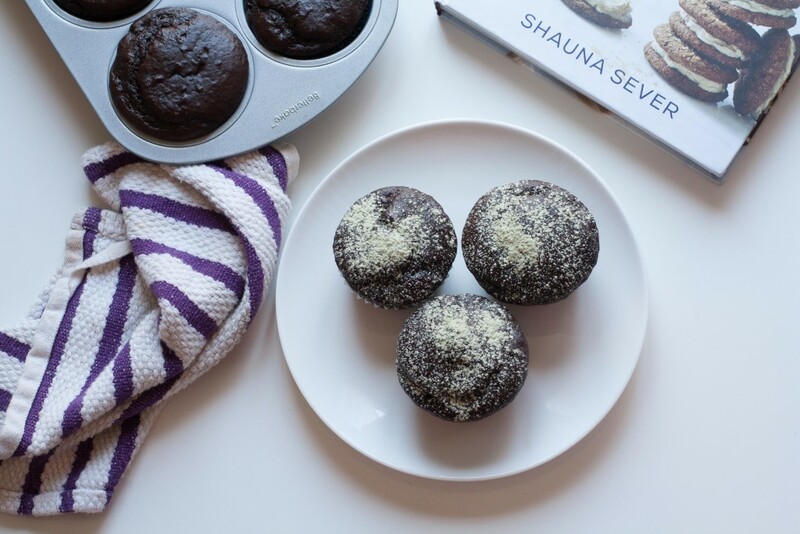 PS- If you’re in the Bay area, Shauna is going to be talking about natural sweeteners and signing books on Saturday, June 11 at 3 over at Omnivore Books in San Francisco. 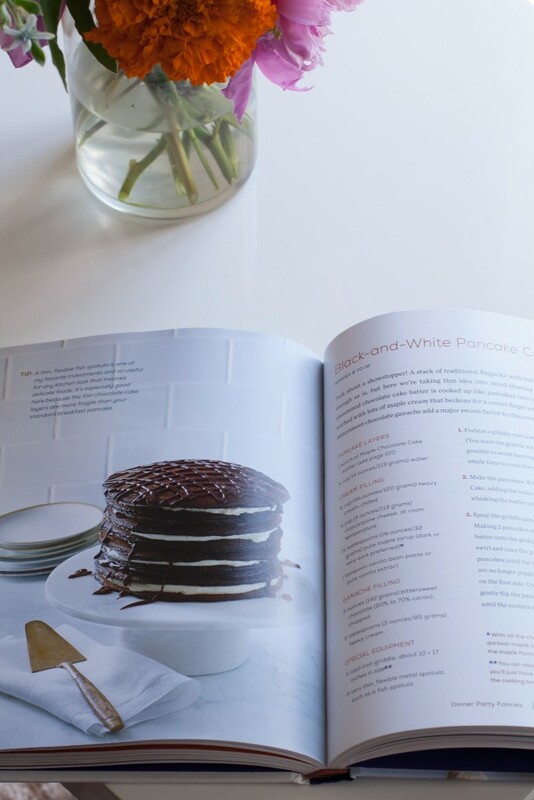 This cake is used in a wickedly good recipe in Real Sweet: the Black and White Pancake Cake (see above photo of the open pages of the cookbook. Just imagine thin layers of chocolate cake sandwiched by cream and drizzled with ganache—need I say more?) 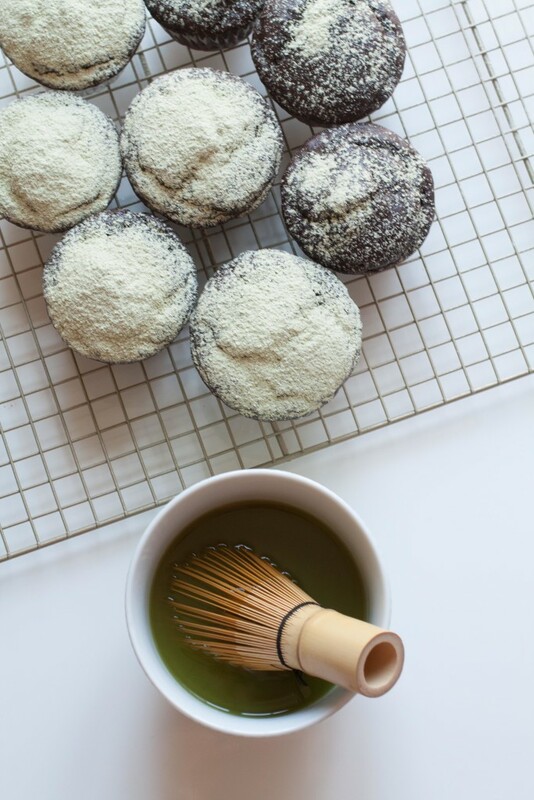 But if you want to whip up some Friday afternoon cupcakes with a slight kick of caffeine, matcha dusting is a must. The chocolate and maple goodness are the right foil for the grassiness of the matcha green tea sugar. You can go easy does it and sift a fine sprinkling of the matcha powdered sugar on top of the cupcakes or go for a full-on green blizzard. The choice is yours. Tip: If you have leftover matcha powdered sugar, store it in a sealed container in a cool spot. Sift it over homemade donuts or whisk up a hot cup of pre-sweetened matcha by sprinkling 1 teaspoon into 4 ounces of hot 170F water and whisking until combined. Add 8 ounces warmed milk or hot water and sip. To make the maple chocolate cake: Position racks in the upper and lower thirds of the oven and preheat the oven to 350F. 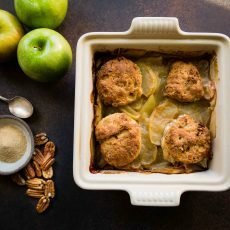 Lightly grease a 9×13-inch rectangular baking pan or two 9-inch round pans (and line them with parchment paper), or line 18 wells of two 12-cup muffin tins with paper liners. 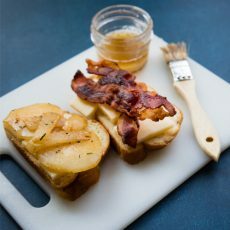 In a large measuring cup or medium bowl, whisk together the maple syrup, yogurt, eggs, oil, and vanilla extract. Pour the wet ingredients into the dry. Using a whisk, energetically blend the batter by hand until smooth and thick, about 1 minute. Spread the batter into the prepared pan or pans. (For cupcakes, fill the cups no more than two-thirds full—you should get 18 cupcakes). Bake until a toothpick inserted into the center comes out clean and the tops of the cakes spring back when lightly touched, 20 minutes for cupcakes, or 30 to 35 minutes for sheet and layer cakes. Cool completely in the pan or pans on a wire rack before inverting and frosting. To make the matcha powdered sugar: sift together the matcha and powdered sugar in a small bowl. Spoon a small amount of the matcha sugar into the sifter and dust the cupcakes as much as you like. Add more matcha sugar to the sifter as needed.